This entry was posted in ELVN News and tagged ELVN on November 20, 2017 by elvn_updates. The holidays are here, and Lakeview is celebrating with fun community events and special promotions that are sure to get the whole family in the holiday spirit. See below for some of the holiday programs happening this holiday season, and explore it all by visiting www.lakeviewchamber.com/Holidays. Explore the best of Lakeview this holiday season with the Lakeview Holiday Gift Guide, showcasing unique local gifts and festive holiday events happening in Lakeview. Printed copies of the guide are available at dozens of local businesses in Lakeview, or you can view it online for the very first time. Browse listings from local shops and restaurants, and make the most of your holiday shopping with the Lakeview Gift Card, accepted at more than 80 local businesses. 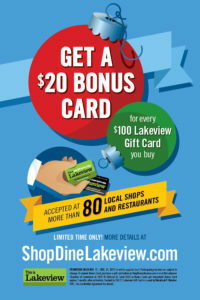 For a limited time only, get a $20 Bonus Card for every $100 Lakeview Gift Card you buy. That’s extra money you can spend on gifts for yourself or others! Terms and conditions apply. Visit ShopDineLakeview.com for more information. Which local businesses have the best holiday windows? 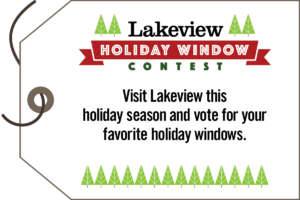 This year, you can decide with the neighborhood’s first-ever Holiday Window Contest! Visit any of the participating businesses listed here beginning on Small Business Saturday (November 25) and cast a vote by text for the businesses whose windows you think deserve to win it all. Texting instructions can be found in each business’s windows or near their checkout counter. You may vote for multiple businesses, but not more than once for any one business. The contest closes on December 17, and winners will be announced on December 20. Message and data rates may apply. For more information, visit www.lakeviewchamber.com/Holidays. 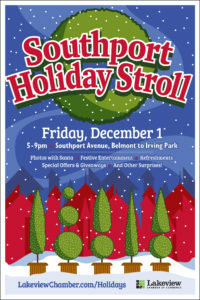 The 22nd Annual Southport Holiday Stroll kicks off the holiday season in the neighborhood. The event features photos with Santa plus festive entertainment, refreshments and holiday specials at participating businesses all evening long. New this year: Participate in the Southport Holiday Stroll Passport program by receiving stamps at participating businesses during the weekend of the Stroll. Get two or more stamps and you’ll be entered for a chance to win one of three prize packages. The more businesses you visit, the more you could win, with the grand prize valued at more than $1,000! From one-of-a-kind boutique shops to eclectic restaurants, Lakeview is a community of small businesses that provide an experience you can’t find anywhere else. Together, these businesses also have a major impact on the local economy, with some studies estimating that as much as $0.50 of every dollar spent at an independent business is recirculated locally. Have you ever wondered how your favorite small business began, or what it takes to become an entrepreneur? 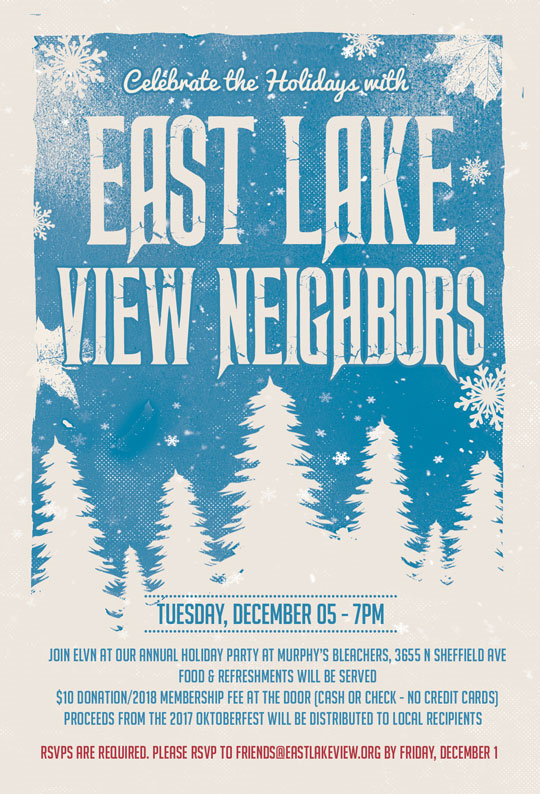 This holiday season, explore the stories behind some of Lakeview’s beloved small businesses in a neighborhood-wide campaign highlighting the faces of small businesses. Each of the participating businesses were nominated by their peers, and local community members voted for the businesses whose stories they most wanted to hear as part of the campaign, which aims to communicate the importance of shopping and eating local. The Faces of Small Business campaign is sponsored by A Little Photo Studio with support from Special Service Area (SSA) 27. 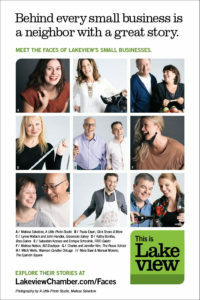 Explore the stories of 25 local businesses by visiting www.lakeviewchamber.com/Faces, and show your support by shopping and eating local year-round. If you’ve walked down the 2900 block of Lincoln Avenue lately, you may have noticed new neighborhood attractions popping up in storefronts that have long been shuttered. It’s all part of a new program called POP at the Lincoln Hub, which presents a rotating series of creative pop-up spaces that showcase local artists, makers and merchants. Presented by the Lakeview Chamber of Commerce and Special Service Area 27, POP provides creative individuals and small businesses with an opportunity to test new ideas while creating an ever-changing attraction in the heart of the Lincoln Hub—the dynamic stretch of Lincoln Avenue between Diversey and Belmont. The program works by temporarily activating vacant and underutilized storefronts until a long-term lease is signed. By filling these spaces with merchants and artists that create interest on the street, the Lakeview Chamber is making available storefronts on the street a more valuable and attractive place to do business. POP is launching this month as a pilot program with two participants: a Milwaukee-based men’s shop called Milworks at 2933 N. Lincoln Ave., and an art installation by local artist Molly Z at 2962 N. Lincoln Ave. Both spaces bring a dynamic to the Lincoln Hub area that has been missing in recent years, including one of the only businesses in the West Lakeview area that specializes in a curated assortment of men’s apparel, footwear, apothecary, small goods, books and magazines, etc. 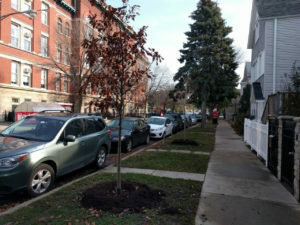 Neighbors Pitch in to Plant More Trees on Lakeview’s Side Streets! Friends of Lakeview, a 501(c)(3) non-profit organization and partner of the Lakeview Chamber and Special Service Area (SSA) 27, launched the Adopt-a-Tree program over the summer to raise funds for the plantings, which help to supplement the efforts of the City and SSA 27 to improve our urban tree canopy. We were able to raise $2,275 to plant five trees, on the 1300 and 1600 blocks of Nelson, and the 1600 block of Barry. These resident-funded trees join nearly 100 new trees that have been planted by SSA 27 in cooperation with the City of Chicago in the past year. While some of these trees were planted in empty tree pits, the SSA has focused its efforts on installing trees in new sidewalk cutouts to create green space where it previously didn’t exist. A majority of these new trees have been planted on portions of Lincoln, Ashland and Belmont avenues. Trees are great for the environment and for property values, but doesn’t walking down a beautiful tree-lined street also just make you smile and put you at ease? We want our neighborhood to be the greenest and most beautiful in Chicago, and thanks to some dedicated neighbors and the work of SSA 27, we’re a step closer to that goal! 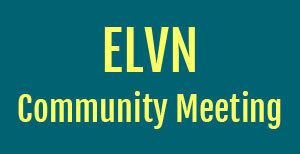 This entry was posted in Community News on November 15, 2017 by elvn_updates. –Get a peek at some of the tasty offerings and unique vendors that will be at the pop-up. –Meet Chicago Market board members and Owners, local community members with a share in the business. –Feel good knowing that you’ve introduced someone to a healthy, tasty, and conscious meal for a well-rounded sustainable holiday. 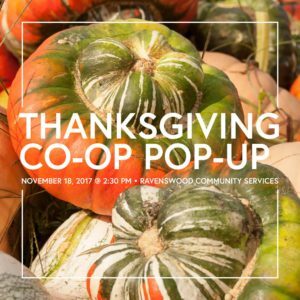 Check out the Thanksgiving Co-Op Pop-Up Market on Facebook. Don’t miss out on the chance to get a tasty bird for the holiday, these things run out fast! You can pre-order your turkey here. TUESDAY, NOVEMBER 7, 2017 AT 7:00 P.M. This entry was posted in ELVN News on November 6, 2017 by elvn_updates.